NEED IT TO BE TAILOR MADE? 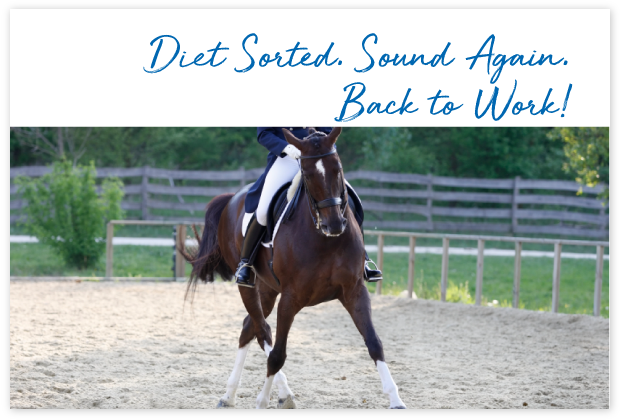 CREATE A DIET THAT’S AN EXACT FIT FOR YOUR HORSE. Nutrient deﬁciency or excess will cause health issues for your horse so it is important you avoid them. FeedXL makes doing this simple. Once we were back in a rehab facility, I sought out Feed XL to help make sure he had, nutritionally, what he needed to heal. It will take time, because his psyche took a hit, but as you can see, his body appears to look pretty good, and the surgery site on his hoof has grown out quickly. Many of you already go to the effort of having your forage tested. But what do all those number mean? And how do they relate to what your horse needs? Simply upload your forage analysis into FeedXL and we will show you what your forage is and perhaps more importantly, is not contributing to the diet. 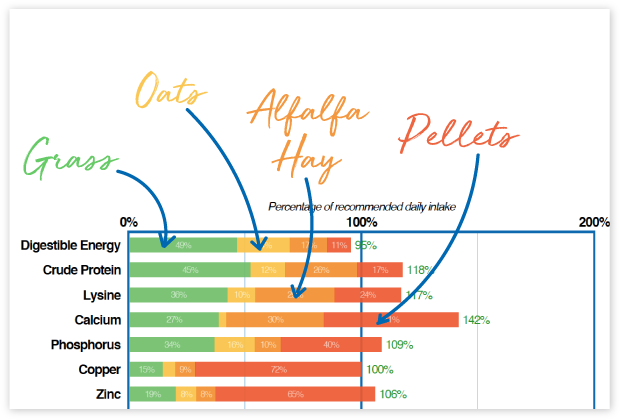 You can then use FeedXL to find the perfect feeds or supplements to ‘top-up’ the nutrients not being provided by your forage. 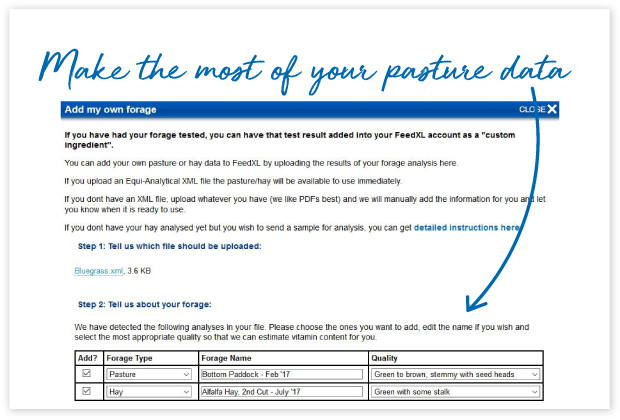 For those of you who can’t have your own forage tested, FeedXL provides you with an extensive and heavily researched database of typical forages that will allow you to still get a very good picture of what your forage is and isn’t providing. FeedXL not only helps to ensure that your horse receives the correct amount of specific minerals, but it also rapidly calculates minerals ratios to make sure the minerals are present in the diet in the right amounts, relative to one another. So put your calculator down and let FeedXL do the number crunching for you. It will save you hours of time and let you spend more quality time with your horse! I really like using FeedXL to balance my horses rations, from horses with ulcers, to retirees, broodmares and foals this software always helps me get the balance right. The addition of the cost data was brilliant, I’ve saved a small fortune. FeedXL is totally, 100% independent from ALL feed and supplement companies. This means we don’t have any sort of vested interest in what you feed. All we care about is that your horse is getting everything he needs and that what you are feeding is truly what is best for him! 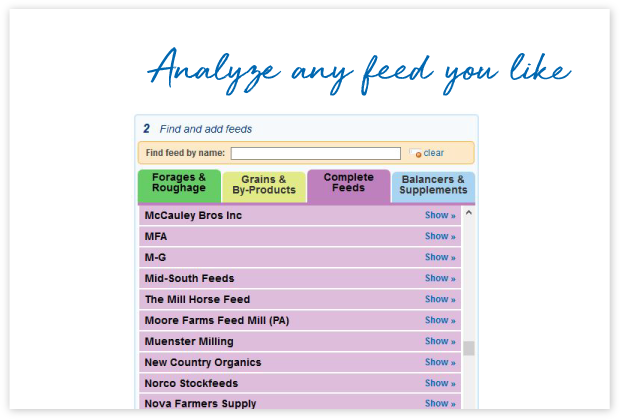 Good news for you, as this allows you to use FeedXL to assess and compare any feed or supplement available to you from any manufacturer. And if you use a product we happen to not have in our database, let us know and we will happily add it for you. 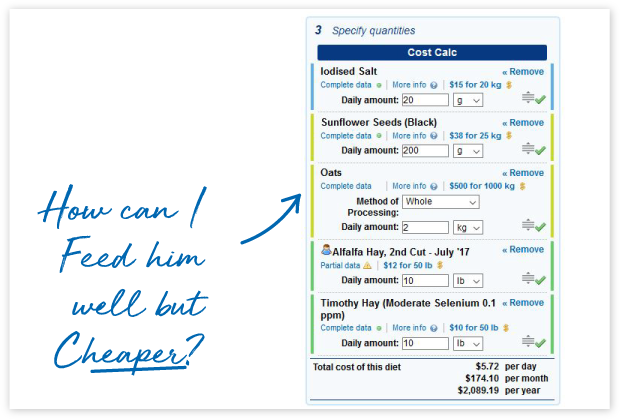 FeedXL allows you to quickly and easily input costs for all of the feeds, forages and supplements you are using and calculates a daily, monthly and annual cost. Which means you can also very easily try multiple combinations of feeds and supplements to find one that works beautifully for your horse without breaking your budget! This is awesome, THANK YOU! I just used the cost feature for the ﬁrst time, and it is PERFECT!!!!! I tell everybody about FeedXL. Absolutely worth every penny! The addition of FeedXL on my farm has transformed my horses into gleaming works of art! Before they looked healthy and happy but now they glow with a shine and health that gets lots of comments wherever I take them. So many joint supplements, so many different nutrients, so many different dose sizes! And they definitely aren’t all created equally. Some are excellent, some are hardly anything more than expensive product filler! There are hundreds of supplements to choose from when it comes to balancing your horse’s diet. 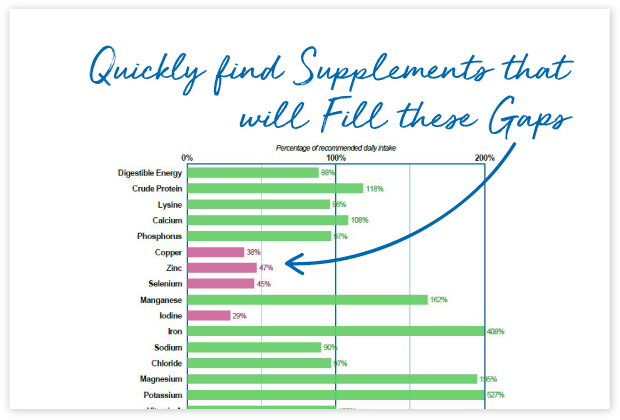 We’ve made it easy for you to fill in the nutrient gaps with FeedXL’s Supplement Finder. 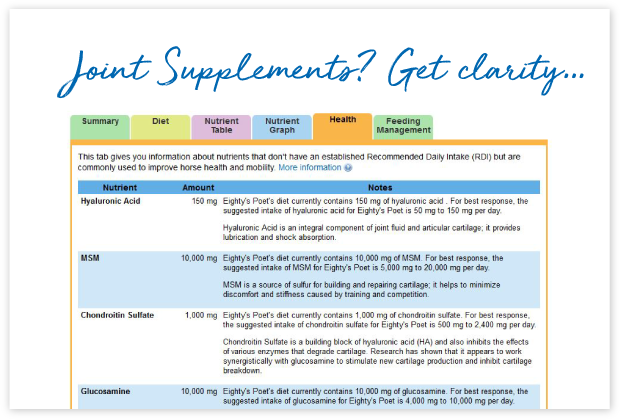 Our clever little supplement finder will look at your horse’s diet and then sift through every single supplement in its database to provide you with a list of supplements that will fill all the gaps without supplying unsafe levels of any nutrient. The result? You can now find multiple options for filling nutrient gaps in a diet is less than 10 seconds. It is then just a matter of you finding one from a brand you know and trust and adding it to the diet! Diagnosis with a nutrition related disorder often throws horse owners into a panic about what is and is not safe to feed and often amongst a whirlwind of confusing and conflicting information about what you should and should not feed. FeedXL is here to help! 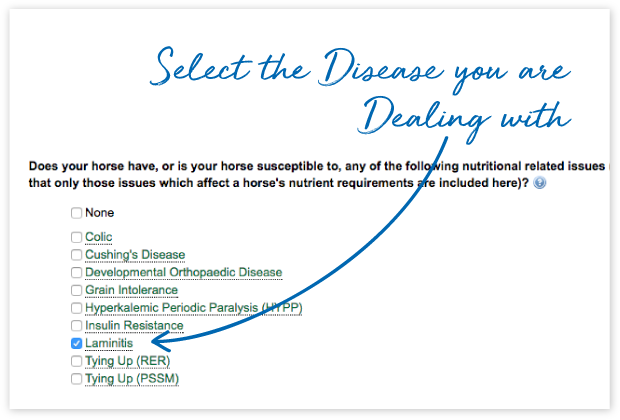 FeedXL allows you to specify that your horse has a nutrition related disease and will then guide you in selecting appropriate feeds for the condition your horse has. FeedXL will also adjust nutrient requirements where needed. For example horses with the PSSM form of tying up will have elevated selenium and vitamin E requirements. Many horses who were thought to be at the end of their careers due to one of these debilitating conditions have gone on to compete and win at the highest levels on their FeedXL diets. Let FeedXL take away confusion and do the hard work of finding safe feeds and supplements and getting nutrient requirements right for your horse so you can get him back to being sound, healthy and happy again! My mare was recently diagnosed with PSSM, and I knew her diet would need an overhaul as a result. I have been able to design a diet that is perfect for her and will help minimize her tying up events. It gives me great peace of mind. 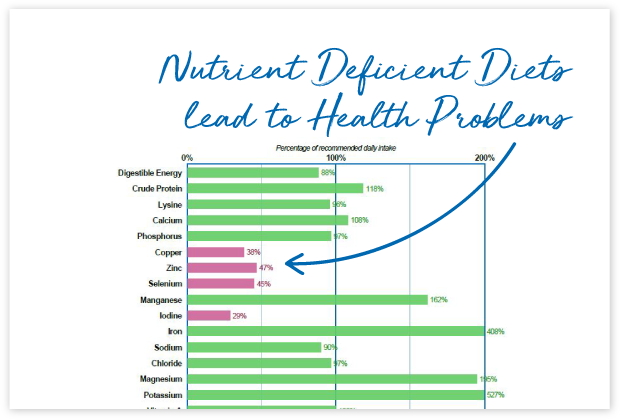 FeedXL not only shows you when nutrient requirements are met or not met, it also shows you what each ingredient is contributing to the diet. 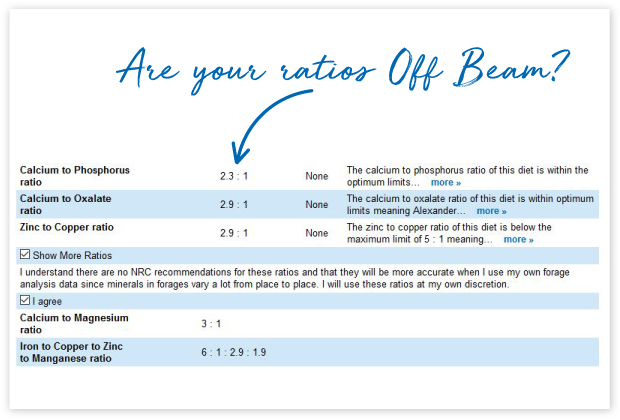 Use this feature to identify ingredients that contribute too much or too little of a certain nutrient to a diet. You can also use it to work out the best ingredient to increase or decrease in the diet to increase or decrease a specific nutrient. For example, if sodium is too high and you have salt in the diet you should be able to quickly identify that the salt is providing a lot of the sodium and therefore to reduce sodium you simply need to reduce salt. 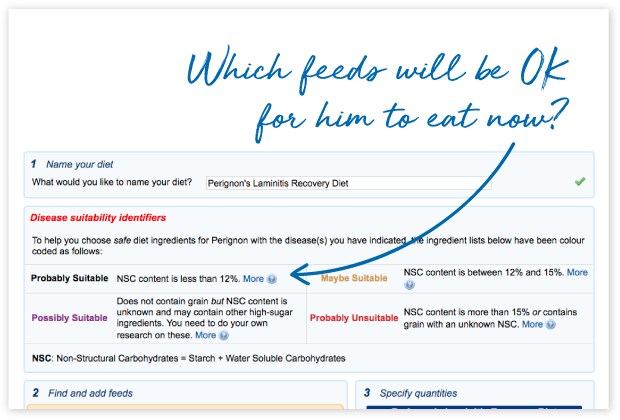 FeedXL allows you to create a diet for any horse or pony. You can enter any bodyweight, breed, age and workload or activity and FeedXL will calculate your horse or pony’s nutrient requirements based on these details. 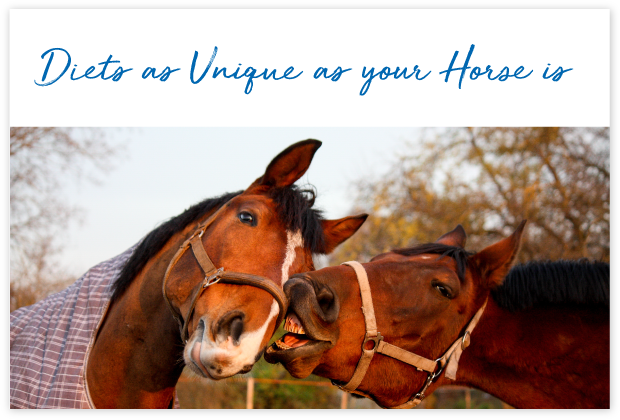 You are also able to specify if your horse is a good doer/easy keeper, poor doer/hard keeper or is just ‘normal’ (if there is such a thing as a normal horse!) and whether you would like your horse to maintain, gain or lose weight. I’ve been using FeedXL since doing my cert 3 in horse industry practice in 2013, 3 years now and I swear by it. I’ve since done my cert 4 in vet nursing and now work as an equine vet nurse. FeedXL has been a great educational tool, as well as for my personal use. I have 4 horses, 2 TBs that came to me as very skinny neglected rescues, 1 pony with a history of laminitis and a QH ﬁlly I picked up at the sales, so all 4 have had very different nutritional needs and FeedXL has been a God send helping me stay on the right track with each horse, keeping them all happy and healthy.